However, it's not clear if a vehicle operating in a public space would be legally allowed to park itself. Driving while using your cellphone is about to take on a whole new meaning, as Tesla starts to roll out an enhanced "Summon" feature that essentially allows drivers to operate their car via a phone app. The electric carmaker will begin rolling out new software that will let its cars park themselves, without having a driver behind the wheel, according to a tweet from CEO Elon Musk late Wednesday. 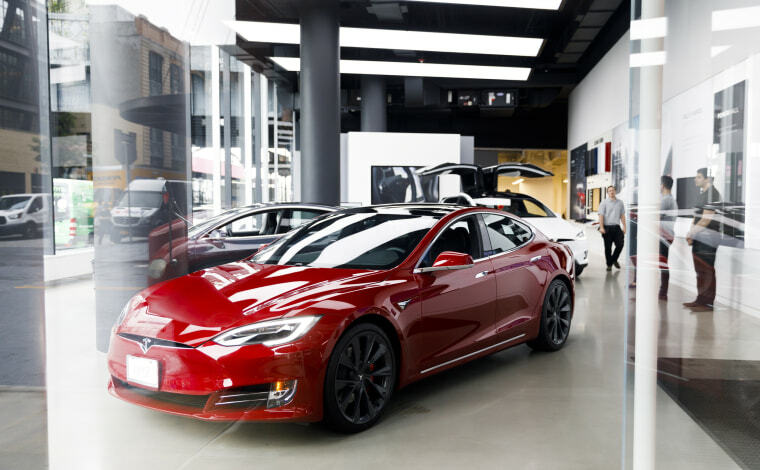 A further upgrade to the "Summon" feature will eventually enable cars to read and follow parking signs, find their own parking space, and pull into it, Musk wrote. Limited auto-parking systems are now widely available in new models offered by a variety of mainstream and luxury manufacturers. They typically allow a motorist to find an appropriate spot, tap a button, and let the car steer into the parking space — though the driver may have to still operate the throttle and brakes. Tesla’s system would allow the driver to step out of the vehicle entirely. The first update to the current “Summon” feature would let a motorist essentially operate the vehicle from outside by holding a button on a smartphone as they guide it into a space. “Car will drive to your phone location and follow you like a pet if you hold down Summon button on Tesla app,” Musk tweeted, noting that the feature “will work on all cars made in past 2 years.” This includes the new Model 3 sedan, and also recent versions of the Models S and X outfitted with Tesla’s latest version of its Autopilot hardware. This more advanced version is expected to be available “by next year,” Musk added. However, it's unclear whether anyone will legally be able to use the new features. With Congress still working on new autonomous vehicle guidelines, state regulators now call the shots and generally require a driver to remain behind the wheel whenever a vehicle is in motion. Individual states and, in some cases, municipalities, set rules for how a vehicle can operate. More than half of the states now permit some testing of autonomous vehicles on public roads. But, in virtually all cases, a licensed motorist must remain behind the wheel ready to take control in an emergency. California is one of a handful of states set to permit testing of fully driverless vehicles, with no one behind the wheel — and perhaps no driver controls in the vehicle to begin with. But such vehicles must be registered in those states and get specific authorization, even unique license plates. So, it is not clear if a vehicle operating in a public space, even a parking lot, would be legally allowed to park using the Tesla software. The California-based automaker isn’t the only manufacturer experimenting with so-called “valet” parking technology. Others include Volvo and BMW. The German automaker has introduced it on several models though it can only operate in a few places, including Great Britain, where regulators in June approved new rules permitting cars to park without a driver behind the wheel. The U.S. Congress is currently moving ahead on autonomous vehicle legislation. A preliminary bill has been approved by the House, but the Senate version remains unfinished and it is unclear if or when it might pass. But there is strong support for a federal bill that would expand the ability to test autonomous and fully driverless technologies. The final measure might authorize the use of a feature like the one Tesla is introducing.